CALL (202) 237-1005 with any questions. 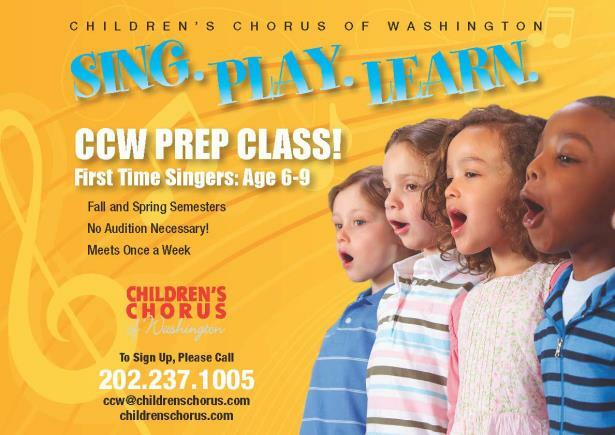 CCW PREP CLASS, a program designed to introduce first-time singers (ages 6-9) to the choral exerience, is now offered in two divisions based on the student's age: PREP Kids & PREP Junior. Both divisions meet once a week for 10 weeks, in the Fall and in the Spring. The 45-minute session format combines interactive musical, movement and rhythmic games. This program plants the seed for a lifelong relationship with music for each child while teaching proper breathing, posture, and basic music reading skills. Ms. Sonya Knussen has an extensive musical background, and a broad range of experience in teaching young children to sing in both America and Britain. With her education/training at The Purcell School of Music in Britain and Boston University, Ms. Knussen has taught children singing at St. Margaret’s School (MD), Old St. Paul’s Church (MD), and Miami Choral Academy (FL). She has very impressive pedagogical skills and an excellent demeanor with the children. « Next, Fall Semester 2013: to be announced. Generally, a PREP Kids student must be age 6 or older as of the first day of the class. CCW uses its discretion for certain students between ages - if a student turns 8 before half-way point of semester, he/she would be placed in PREP Junior. If a student turns 8 after the half-way point of semester, he/she should be placed in PREP Kids. « Curriculum: This division is about finding your singing voice, the beginning stages of reading rhythms with words. The music theory is group oriented: aspects of the music will be written on the white board for everyone to learn together at the same pace. Music is theme-based each semester, and repertoire changes from semester to semester. Generally, a PREP Junior student must turn 8 as of the first day of class. CCW uses its discretion for certain students between ages - if a student turns 8 before half-way point of semester, he/she would be placed in PREP Junior. If a student turns 8 after the half-way point of semester, he/she should be placed in PREP Kids. If a student turns 10 before the half-way point of semester, he/she cannot register for PREP Junior. Previous enrollment in PREP Kids is NOT a requirement/pre-requisite to register for PREP Junior. « Curriculum: This division will continue with the work done in PREP Kids, but will also include more formal music theory. Worksheets may be distributed during class, and light homework may be given each week to reinforce what is being learned in class. Students will learn how to read music with the words underneath and to understand how all the elements correspond on the page with the support of a piano accompanist. As the class nears the end of semester, PREP Junior students will know what to expect in a CCW audition situation, as 9-year old students prepare for their audition for TREBLE CHORUS. ***NO student is automatically accepted into TREBLE CHORUS, and being enrolled in PREP Kids and/or PREP Junior does NOT guarantee an automatic acceptance into TREBLE. Students who are old enough to audition for TREBLE CHORUS but not yet ready to join the ensemble for auditioning are welcome into PREP Junior. However, if a student turns 10 before the half-way point of semester, he/she cannot regiser for PREP Junior.